Search Results based on search term relevance. 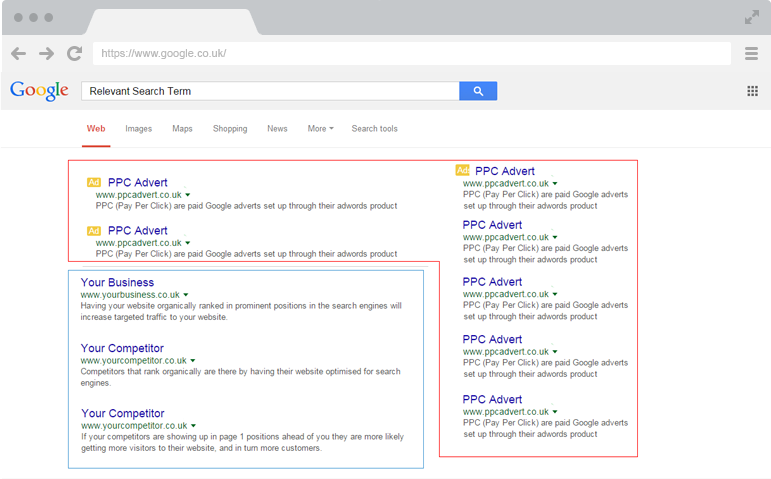 Pay Per Click (adverts), Google product set up with adwords. Using our knowledge of how Search Engines will measure the engagement, performance and relevance of your website, we can develop you an effective SEO strategy that will rank your website organically for targeted keywords that relate to your business. We will increase your search visibility to drive high quality traffic directly to your website, generating more enquiries and growing online sales. Having a website that ranks well is a great start to improving online sales but it’s vitally important to make sure that when those visitors land on your website they convert into business. To achieve this you need a website that engages with the user and fulfills their needs. We ensure that each page on your website is relevant to the topic of the search criteria typed in by the visitor. We plan the user journey so they can easily flow through your website until it has satisfied their needs and they can easily connect with. Focusing on targeting only the highest search terms may increase traffic to your website, but there are probably 1000s of other keywords and variations people will use to search for the products and services you provide. Not also targeting these means you might be missing out on a huge amount of organic traffic and potential customers. Our SEO service focuses on continually improving your rankings on the main keywords but also identifying potential lucrative keywords that will increase organic traffic. We will carry out ongoing research into what your target market is searching for and create additional content to allow your business to be visible to them. We learn about your business and your target market to establish where they go to find the products and services you provide, we then focus on a strategy that puts your business directly in front of those people. We analyse your top competitors on the web and monitor their SEO efforts. This allows us to tailor our strategy to ensure that we are implementing the best tactics to reach your target market. We research your market & the best suited keywords according to your budget & goals to allow us to create a strategy that is both realistic and takes opportunity within your target market. We ensure that your websites structure, code and key elements such as titles, meta data and headings are optimised to be align with search engine algorithms and are effectively targeting the keyword goals. Content is the backbone of your website. We create high-quality compelling content that clearly tells search engines what you do as well as being engaging with visitors to help persuade the that you are they company they need. We market your business and website online with quality sources. The ensure that links we create improve your score with search engines, whilst also providing additional exposure to get people talking about your brand. It’s important to us that you enjoy long term success from your SEO campaign. We continually monitor your campaign to ensure that your strategy is inline with ever changing search engine algorithms and that we’re maintaining and improving your rankings. SEO leads 8x more likley to convert into customers than outbound leads. Are you visible where they search?